What stands out on the partly ruined six-wheeled wooden chariot are the blocks of intricate carvings. The carvings are really the work of a master-craftsman, devoting painstaking days and weeks on his creation. We talk about the carvings of Khajuraho, Konark and Mahabalipuram in India, the pre-historic carvings and sculpture, the works in ancient Egypt, Greece and Rome, while we ignore the great works of art at our doorstep. 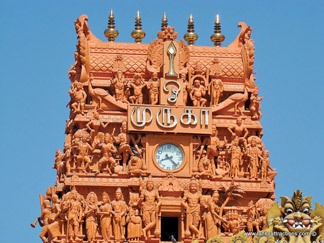 The Jaffna peninsula is a true museum of carvings, sculpture and religious architecture. The Maviddapuram Kanthaswamy Kovil is one temple where one could spend hours, studying the carvings on stone and wood, and cement and mortar. After a complete walk around the entire temple complex, it is easy to shut one’s eyes and try to imagine what the temple would have been, 5000 years ago as a small place of worship, as the legend goes, and after the temple was built by the Chola princess, Maruthapura Veeravalli, who had been cured of her ailments and her horse face had disappeared after bathing in the Keerimali tank. It is at this kovil that the chariot stands to this day retaining much of it’s former splendour. There had been an attempt to destroy the temple and build a church at the site. The attempt had failed, but there is still traces of the efforts to be seen at the main entrance to the temple. Unfortunately the Nallur temple had been destroyed in the 16th century, but the foundation can still be seen. The temple was rebuild at a short distance from the original site and stands today as one of the major attractions in Jaffna. Goddess Lakshmi is often portrayed with four hands as Gajalakshmi, specially on the door frame or the entrance to a house. Yet in Kankesanturai, close to the cement factory there is a very old house, with a figure of Goddess Lakshmi above the arch at the entrance. This figure had only two hands, when I first saw it on March 1st, 1968, since two hands had broken off. The figure still has only two hands, as I walked into the house on November 8th, 2011. Nobody had attempted to restore them. Not many visitors would notice this, as the stumps of the broken hands had been painted over and over again and are not noticeable. Probably it was accepted as it is, even by those who were aware of different forms of the goddess, to accept the figure as a two-handed Lakshmi, known as Samanyalakshmi or Indralakshmi. Incidentally this house was assigned to us as our hostel, when we joined the Cement Corporation 43 years ago, making me realize today what ‘walking down memory lane’ really means, where a cruel war had ravaged for over 30 years. Keerimali tank is still a popular bathing place, and how wonderful if all visitors could accept this as a sacred site, that people come to bathe at this tank with the hope of curing their ailments and that the tank has a long history behind it. The same could be said about the Keerimali Thirutambaleswaram Kovil, now known as the Naguleswaram Sivam Kovil. Just as the Maviddapuram temple is said to be at least 5000 years old, the Keerimali temple is also said to have a very ancient history, as it is identified as one of the five ancient Siva temples in Sri Lanka, alongside Ketheeswaram in Mannar, Koneswaram in Trincomalee, Muneswaram in Chilaw and Tondeswaram in Dondra. Just as persecution and suppression cannot keep any religious faith down for long, no one could destroy a place of worship and expect to keep it down for long. The faithful will always re-erect the buildings, replace the statues, carvings and paintings. Maviddapuram is also one such place of worship, which had been destroyed and rebuilt, several times. The wonder is how they have retained the ancient glory of the structure every time. Retaining traditions and preserving the atmosphere of the temples is what we find all over Jaffna, where the artists and the sculptors have been playing a major role. Walking through these Kovils, we are reminded that modern art is also like a religion, and the Art Galleries today are also like temples, with the difference that art galleries are for the few while the temples are for everyone, the rich and the poor, the educated and the not-so educated. In the pre-historic art galleries in the caves too, we could identify some of the paintings as conceptual or perceptual, depending on how we look at them. Religion could have been the beginning of art, if we are to believe that primitive art forms found in caves occupied by pre-historic man were religious symbols and images. If on the other hand art was the beginning of religion then we could also consider that almost all religions have survived because of art. It was the artist who did the paintings, the sculptures and the symbols and who helped to preserve the religious faiths and practices, during all suppressions, forced conversions and anti-religious campaigns. Unfortunately what is sacred art for one man could be a pagan idol for another, which could explain the vandalism faced by ancient temples throughout history. Tourists and curious visitors would see them simply as works of art, which did not demand much respect. When we look at art as a religion it reminds us that very often it is the iconophile who creates the iconoclast, who could end up becoming a new iconophile himself.